There’s just one month to go until this years Kiosk London Expo and Cammax are pleased to announce that we’ll be exhibiting at the show. Returning for it’s third year the show promises to be an exciting event, revealing all there is to know about todays kiosk industry. The show will take place at the Barbican Centre between the 16-17th October 2013 and will act as a central meeting point for the industries movers and shakers; including managing directors, VPs, marketing and project managers, purchasers and so on. 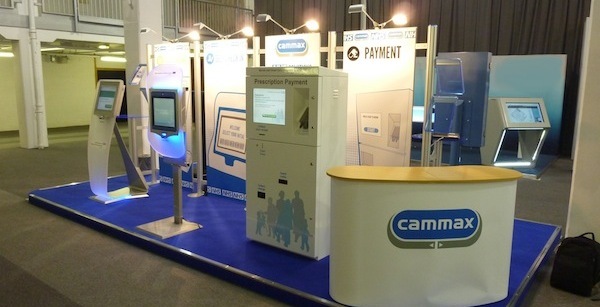 The Cammax team will be on hand at the show to discuss how adding a self service solution to your business can boost sales and increase your ROI and answer any queries you may have. As we as this we’ll be showcasing some of our most successful kiosks and talking about how they are making a profound impact within their market. The kiosks that will be on display include; council payment kiosks for Halton Council; our Genesis bespoke 22” widescreen (along with a demo of the Cammax secure browser), which is a great example of kiosk customization; Clearview 19″, showing patient check in for the NHS; Clearview wall mount, demonstrating hospital way finding; and the P&G kiosk which is a great example of how a kiosk can be used to aid access control and translation, across sectors which may need to facilitate communication between multi-lingual users. KLX 2013 will be the number one place to talk everything self-service related, attend key seminars and will also provide the perfect networking opportunity. The show is free to attend so simply register for Kiosk London Expo 2013. If you’re going to the show get in contact with the Cammax team to arrange a meeting with us. We look forward to seeing you there! For more details on the show and how to find it, visit the official Kiosk London Expo 2013 website.